My Auntie L and Cousin D saw this bag and thought I would love it. They were right, I do love it!!! oh and that is my surprise face :) The inside is lined with vinyl and it has a small zip pouch on the front. This is going to be perfect for my travel stuff. And perfect timing too because it is Bachelorette Party weekend for me and my BFF B!!! We tagged along on Hubby business trip to Boston! It was a really good time. I walked the whole city until my legs were about to fall off. PB and I were on our own all day until dinner which we got to enjoy with Hubby. We even went on a few adventures to some fabric stores. I went to one that made me wish I lived right above it. It is called Gather Here. When I walked in the store I was drooling over all the fabric and beautiful yarn. 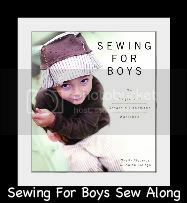 They had a class going on of young tween age girls learning to make a skirt. It was the most inspiring thing I have ever seen at a store. Some were focused on their machines and some were cutting fabric. A few were picking fabrics out for their next project and their conversation was hilarious. It just seemed like just the most fun place to be. I really want to get finished on PB's quilt after seeing those girls sewing. I also picked up new fabric for the back... i'll share later. I had a crazy week last week, now a crazy fun weekend and an even crazier week next week. Hopefully I will be here to share some things next week :) happy weekend!!! This post makes me happy....your joy about the bag, the trip and the store.. radiates! Hi, my name is Kris. 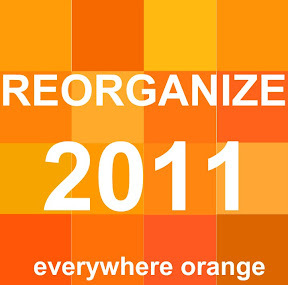 Welcome to everywhere orange! I'm a high school art teacher taking a break to be at home with my 5 and 1 year old sons. I have always enjoyed crafting and cooking, but in the last 5 years at home I finally had the time to really explore new things in the kitchen and focus on my craftiness at home. The color orange and I go way back, long before I met my husband 16.5 years ago. I wanted a place I could share recipes and the crafty things I make and some orange. Thanks for stopping by!! just bought fabric to make a quilt for the beach and picnics this summer! can't wait to start. Nothing too fancy, just stripes. i'm on Pinterest. Check out my Orange!! 1-3 posts of recipes or crafts. Curious about how much orange is in my house? Stay tuned for Orange Fridays! Want my posts emailed right to your inbox? The complete and updated list. I AM DONE!!!! well, there are a few things not crossed off but they are going on the spring project list. Fabric finds in Boston and quilt progress! Tutorial Weather Board- Guest post from Boy, Oh Boy, Oh Boy!